To make Waterfox stand out a bit more, it’s compiled with optimizations so that it will run more efficiently and faster than just compiling Firefox as a 64-Bit program.It works exactly the same as Firefox and the version numbers are identical. 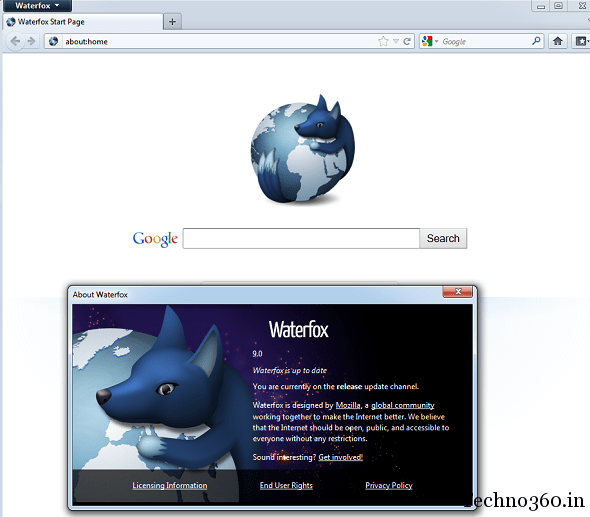 Tt is a relatively lightweight application and all plug-ins and extensions working on Firefox will work on Waterfox. Why should I use a 64-Bit version of Firefox? The 64-Bit version loads quicker and is much more responsive than the 32-Bit build. For people with newer (64-bit) systems, it allows them to use the full potential of their systems. How does it compare to 32-Bit Firefox? All above are benefits from this firefox variant, but there are disadvantages too, as it is a 3rd party build you cannot report any bugs and you’ll just have to hope that they get fixed in the next update .Also I’m not sure how long it will continue to be updated in parallel with future versions of Firefox and if Mozilla relased 64bit version of Firefox, whether they continue waterfox project. But as for now with Waterfox 9.0 you can enjoy faster speeds on your 64-bit system . Note: If you get missing msvcr100.dll error, download & install visual C++ 2010 Redistributable Package (x64) from here [5.5 MB]. You say that the performance is better? But it is better to quantify that with hard numbers and graphs. Then we can determine if it is worth installing.